Pictured above: Collings Guitars' Statesman LC Deluxe with TV Jones pickups and Bigsby temolo. Photo courtesy of Collings Guitars. Collings: "I moved from Ohio to Houston, and I took a job, just to get settled, in a machine shop. Real high paying…at the time and all that. I never cashed my checks. I had plenty of money, because I didn’t do anything. "Then one day I said, (slamming his hand on the table) ‘That’s it. I’m gonna go make guitars!’ But I had been thinking about it. I had it all planned. In my little apartment, it took me a few weeks to make my first guitar." TMO: Just a few weeks? Collings: "Well, it took me a year in my head. And finally I said, ‘It’s time to go.’ So I found the people. Found the people to help me. Found the wood. There wasn’t any place to get it, at that time. Well there was, but I didn’t know about it. There was just no easy place to find that (information), because there was no internet. "We had something called Whole Earth Catalog. It would have these odd little ads from places. And one guy that was listed in there was Gurian Guitars. He’s about 75 now. A really good friend of mine. And I never called him. But I said, ‘There’s a guy making guitars!’ I read down the ad, and I was like, ‘Wow’. But that’s about it. I didn’t know anybody…but I started to find (more people)…and more sources (for wood) and stuff like that." TMO: That first guitar. Do you still have it? Collings: "No. I have the second guitar though. I just bought it back." TMO: Does anyone know where that first guitar you made is? TMO: Yeah, yeah. I just saw them at Kerrville Folk Fest. Collings: "Ezra Idlet (from Trout Fishing)…bought that guitar for $400…out of my closet. And it just got stolen on the road!" TMO: That’s interesting. So if he bought the first one…you must have been running around with musicians, or meeting lots of Houston musicians? Collings: “What I did...Well, he didn’t buy the first one. The first one wasn’t for sale. He bought the first one after I’d made maybe my 20th guitar. My first guitar was kind of an embarrassing piece, because you try to do everything you learned in one shot. But you didn’t learn anything, because you have no feedback loop. So what do you know: nothing. "So you got to do it. And you (get done and go) awwwww (makes a not so good grimace). "So the second one, I thought I better stick to a plan. And I made my second one more like a Martin, or a Gallagher of the time. And it was a good guitar. And I sold that to a guy, Hector Romain. Then, I went to a club called Theodore’s in downtown Montrose. And great musicians of Houston were living in the Montrose neighborhood and started playing that club. And I said, ‘My God. I’ve never seen (a music scene like) this anywhere.’ Ohio didn’t have anything like that. "And there was a good guitar player that played lots of notes. And I said, ‘Listen. I’m a guitar maker. And I’d like to make you a guitar. 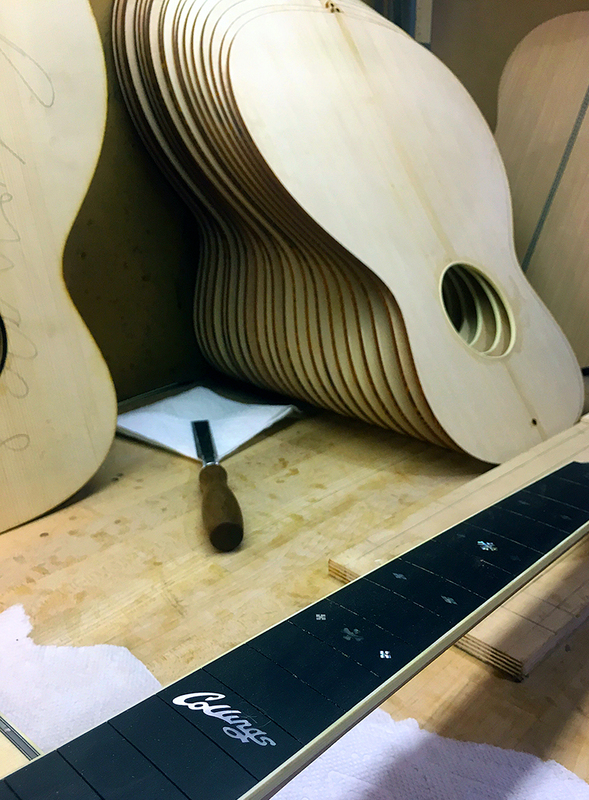 You buy the wood, and I’ll make the guitar.’ He said, ‘How many guitars have you made?’ I said, ‘Oh…50.’ (laughs) Actually I'd only 2." Collings: “Well, you gotta start somewhere. A little lie. (laughs) We still laugh about it. Rick Gordon was his name. "And I made this guitar. It just came out of the shoot…and it was magical. Wonderful. Whew. Wow. "The next day, I had 10 orders. And that’s how it all started. "Then I took the damn money. The deposits. Spent it. Didn’t do the work. Then I learned the first rule of business: don’t use other people’s money to build your (expletive). "So those deposits became part of my policy: a total return on a deposit. And it’s still a policy today." TMO: And it’s interesting, because it seems like from that moment, until now, the demand for your guitars has always been a little bit greater than the supply. Collings: "Yes. Even through the last 10 years, which has been a downtown in the music scene. 2007 was too." Collings: “And there’s a lot of that. And expanding the line this way (horizontally), so you sell one model…you sell more models. So you have to do that. And your overhead goes up, and then you’re stuck." Collings: “If everything was really running well, we’d be doing really well. But since we have hiccups, from not enough (staff). What happened in the down-turn, we wouldn’t fill that back up with people. We would wait until it’s too late. And so the training time would lag. And so you have this big lag of space (for training new staff) that you have to do. So we’re the balance. "It used to be, the dealers were the balance. And we’d keep shoving (the guitars) down their throat. But there’s only so much (inventory) you want them to have before they start discounting like crazy. So that’s the big problem in the industry: there’s no buffer for us. So we have to try to keep up just in time with the market. And it’s hard to balance all that out with cash. So we get caught. Right now we have 2 ½ million more dollars in orders for this year, than last year." Collings: "It’s unbelievable. Some people look at that as a real burden. I look at it as a golden goose’s egg! Let’s go to town!" TMO: It seems like your scaling up of employees has been an organic process of growth over the years. Collings: “It has been very hard (growing and hiring employees). Through the years, people have been here a long time. We just lost one of our really good guys because he wanted to follow his dreams. "If you don't have a dream, I’d probably fire you. I’m glad for him. He wants to do organic farming, and live off of it. "I said, ‘Dude…any help you need. If you wanna come back and work, whatever. He’d been here 18 years. Wonderful employee! Collings: "I said, ‘Good. Tell me how that organic farming works.’"
TMO: I met the gentleman in the factory that has been with you since very early on. The gentleman that picks the wood out to be used for each guitar. Collings: "You have to balance that payroll to your output. So as we train new people, that payroll goes up, and it’s not balanced anymore. Their output is not what it should be. You have to get it there, and we’re getting more right now. Because they’re all not gonna make it. Half of (the new hires) might make it. That would be excellent if we picked (new hires) that well. That would be unbelievable. The 100 employees we have has taken forever to get there (up to speed). You can’t just bring them in and go to work. It’s like the 1930s (and an assembly line). They all know at least their job. I wish they were all more well rounded and knew the beginning parts of getting wood out of a tree, and being able to be that guy that can do everything. But it’s just not there. So I can’t give them that (all encompassing education). "I would love to. And we were going to make a little school, and try to do it. And just do it in Austin...just starting there. And it’s a 10 week course on what it takes to make a guitar with tools. Not with my jigs. Not with my tools. But with real tools that we make…that we make, and understand. Wouldn’t that be cool?" TMO: That would be super cool! Collings: That would be really cool. So maybe we’d get more to the root of this woodworking thing. It’s very rare. But as you know: workers, and artists...they're always penalized. Right? It doesn’t matter. We are the short stick of the deal. Nobody with money gives a (expletive) about us. So, you gotta know that. And they have to know it coming in here." 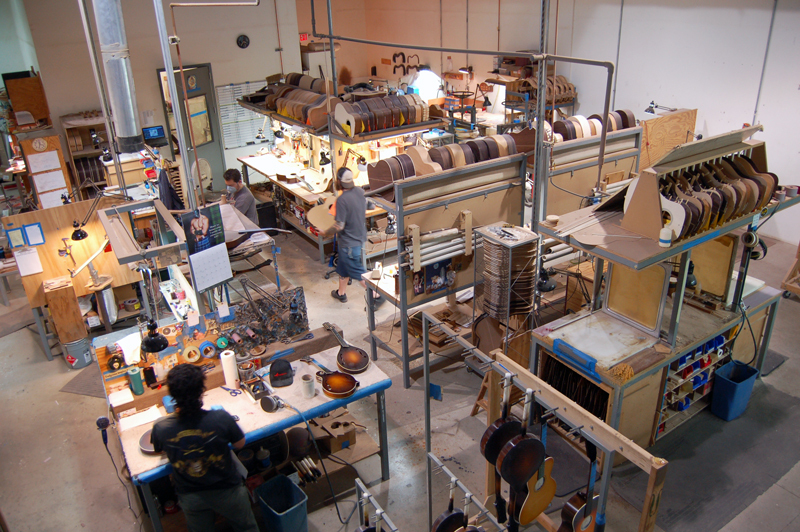 So you’re looking for experienced luthiers that…? Collings: No. They’re not going to be luthiers. "And they’re going to have good hand/eye coordination. That’s the killer. You can have all the drive in the world, but if you can’t push that button at the right time and space, you’re not gonna get it." “It’s really hard…because you come in with no experience, and you have a whole new world thrown at you. You know, I barely had shop class. My father, in the 1930s…he talked about that shop class until the day he died. They were so good. They taught people the beginnings of folding metal, making these things, doing this, blah, blah, blah. And it was like…that was the course!" "It’s a tough deal. And then to tell someone that is never any fun, so we never do. You don’t ever want to pop a guy’s cork. But it’s hard to see those instruments sometimes (made by beginning luthiers). Hard. TMO: You mentioned earlier one of the first guitars you made, you were going for something with a similar tone to a Martin guitar. Collings: "You’re so nervous going into the design phase, that you don’t know anything that really works anyhow: scale length, how thick it should be, size, why it should be this thick, why it’s that thick, why the braces are shaped a certain way. You just gotta make it. "I thought I had it all figured out: that’s the best part of this one, that’s the best part of that one…and I put it all together and (he makes a raspberry sound with his mouth). It won’t work. And I had to come up with (the realization) that if you ain’t got it here (he points at his heart), you ain’t got it here (he points at his head). You gotta have that intuition and gut instinct to follow." TMO: Is there something significant with the aging of the wood in relation to sound? TMO: And is this partially why the older violins are so highly valued? Collings: "Well, you would think that. And a lot of it is true. It’s different. There’s no question. Is it better? Yes and no. "I mean, an old guitar versus a new guitar? We could have a (Martin) 37, which we did in the room the other day. And we could talk about/compare it to a new guitar from my shop. But a seasoned pro might want more evenness between the notes. Or something else…like a high note didn’t pop out. That’s what we (Collings and Punch Brothers' guitarist Chris Eldridge) were talking about. And how I will take that, and shove it down the register, and put it here in the middle more, and add less highs and sizzle, and stuff like that. "So you start getting into stuff like that, and that’s not something (you can learn) in a book. That’s out there - gut instinct - and it’s great to play with it. But it took me studying those guitars so long to be able to make a new one sound like that old one. Or closer to it than we’ve ever come, without those highs, which I hate. "I didn’t start getting it until I lost my hearing, and really started paying attention to decibels and stuff. See, I always like a loud guitar. And (Eldridge) said it’s not important. No, it’s probably not important, but everybody out there likes a loud guitar. They want it jumping right out. "But a pro like Eldridge might want it a little more inward (sounding), and his 37 is. I have a friend with a Martin 36 that he needs to bring by, and it’s a little different. And the differences are amazing between those two years." Collings: "Well neither am I. There is no science (in this discussion)." TMO: But is there something that happens with the older wood producing a certain resonance? Collings: "Yes. Yes. Yes. It’s easier to move (and push sound). It will stay more stable. Everything about it." TMO: Easier to move the notes? Collings: "Yes. You just give it a little bit, and a lot will shake. "So I have a Martin 38 downstairs, and we could play that, and we could play a newer guitar…and you play the newer guitar and the notes and sound is coming out of everywhere. Very fat (sounding). So...yes. "And you’re going to have a fatter note. You’re gonna hit that B note, and they’ll be no highs in it. It will be round, like this. It won’t be pointed, and that B never does that on a guitar. But when you get a B note to happen, that guitar is happening! Almost always!" Make sure to check out part 2 of this interview in our July 2017 newsletter, next month!